I want to go someplace . . . I want to be somewhere far away from the city where people smile and say hello. I want be where the wind sounds like music, and where rainfall is beautiful like a fairytale or a lullaby. 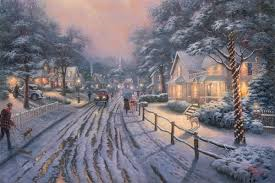 I want go someplace where the snowfall, the small town streetlamps, the quiet snow-covered roads, and lights from farmhouses are like something from a painting I once saw as a young boy. I lived in a town like this towards the end of my teenage years. The town was so small that cars could drive through without knowing the town began or ended. At night, the stars lit the sky. And during the full moon, a bluish light stretched across empty fields where cows stood in large open pastures. Winter nights were never dark during the full moon. The moonbeams reflected against the snowy ground and bounced back to brighten the sky. I felt lost then. Perhaps this was because I was too young to enjoy my own stillness. I had too many questions to ask and too many thoughts for me to switch into something calm, or neutral. Back then, I needed to feel the surge of adrenaline. I need to find my place in the crowd. I needed the wild life and all that went with it. I was too young to understand the magnificence of a quiet night. I was too busy trying to be in the middle of the action. I needed to be alive and involved. But always involving myself meant I never knew the compliment of being invited. Always involving myself meant I was worried about the insult of not being included. Now grown, I have found my list of questions will always be ongoing. I have matured and the need to prove myself to others or resist the boredom with acts of aggression has given way to acceptance. Not all will go as I ask. Life will happen, which means I will go through mixture of good days and bad. People will move in and out of my life. Some will stay long and some will go quickly. There comes a point where a man grows tired of the race. There comes a time when a man grows weak of trying to keep up with the greener grass in the yard next door. As well, there comes a time when defending yourself in unimportant arguments submit to the need for self-preservation and sanity. The useless becomes obvious. All a man can do is surrender to win. Then, he can start over and find peace within himself. and the idea of home . . .
is all he can see.